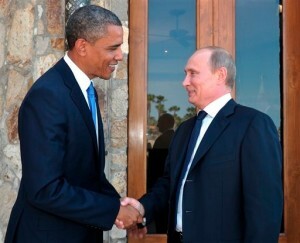 US President Barack Obama and his Russian counterpart Vladimir Putin on Monday discussed the conflict in Syria and agreed to meet in Russia in September. In a phone conversation initiated by President Obama, the US leader stressed his concern over the alleged use of chemical weapons in Syria. Britain’s prime minister David Cameron backed the US assessment on Friday when he said there was growing evidence of chemical weapons use. Washington is seeking more clear facts before taking further action, though Obama has called the use of or failure to secure such weapons by the Syrian government a “game changer” in his judgment about the Syrian conflict. Syria said last Friday that Damascus would agree to inspections of the alleged use of chemical weapons in Syria if conducted by Russian experts. “If there is a need to investigate in a field, we’d offer that to be done by the Russian experts,” a visiting Syrian official told reporters in Moscow. Putin and Obama agreed to “stay in close consultation” and instructed their foreign ministers to continue discussions on Syria, according to the White House. They are set to meet in June when leaders of the Group of Eight (G8) industrialised nations meet in Northern Ireland and again in September for a bilateral meet in Russia. Obama reiterated his appreciation for the close cooperation the United States has received from Russia following the Boston Marathon bombing. “The two leaders discussed cooperation on counterterrorism and security issues going forward, including with respect to the 2014 Olympics in Sochi in Russia,” the White House noted. Obama also conveyed his condolences over the tragic psychiatric hospital fire outside of Moscow that killed dozens last week.